Right from the start what is an air conditioner? An air conditioner (often abbreviated to AC in the United States and Canada, and air-con in Australia and in Britain) is an appliance or mechanism designed to extract heat from an area using a refrigeration cycle. In construction, a complete system of heating, ventilation and air conditioning is referred to as HVAC. Without any doubts this system has great advantages but it can lead to increasing of utility bills, trapping yourself indoors, noise, blackouts, illnesses because of coldness and to climate change and smog in the perspective. Moreover, some problems can appear because of improper installation of air conditioners as well as possible inadequate maintenance. But the most widespread fault in using air conditioners is to leave windows and doors open. So what is the possible way out? To abandon using a device that can create a suitable microclimate in your apartments? Definitely NOT! Why not try the latest achievement in the cooling sphere? 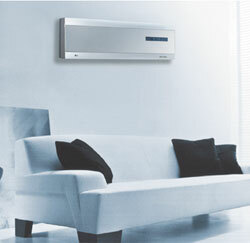 Ductless Split Air Conditioners offer wide variety in solving your cooling and heating requirements. The evaporator - that is an indoor unit - is installed inside the room, enclosed in a handsome space saving cabinet. Then it should be connected with an outdoor part scientifically called a condenser via refrigerant (coolant) pipes. Simple to install - simple to operate. No ductwork is involved and you save hundreds of money on electricity consumption. Such conditioners do not require much free space and won't spoil your room planning and design. Such an indoor unit was specifically designed to provide whisper quiet operation at the same time this doesn't recoil on the efficiency - rotary compressors provide powerful cooling at the lowest noise levels in the industry. Ductless air conditioner is the ideal air conditioning solution for installations where adding ductwork is impractical or too expensive. The matched combination of indoor air handler and outdoor condenser is efficient and easy to install. Air conditioner is a necessary appliance to keep your home cool and comfortable in the warmer months of high warm areas.It is a very famous appliance for home and to provide a comfortable climate.